Why do we have peanuts everywhere if they are among the top eight food allergies in the USA? Tree nuts are in there too, but peanuts are everywhere in places where you wouldn’t think they’d be. And at this time of year, with Halloween and Christmas having lots of peanut butter related snacks, is it too much? We have Reese’s, Snickers, peanut M&M’s, peanut brittle, peanut butter fudge, turtle candies, and probably more for these big holidays. And peanut butter is seen as healthier than some alternatives like candy canes and caramel candy. With all the unhealthy options out there, it’s no wonder the food companies turn to peanuts/ peanut butter as the “safe” bet. According to wikipedia, we are third in terms of growing the most peanuts. China and India grow more and do not have the pervasive peanut allergy that the US has. They don’t process them into peanut butter, but instead make peanut oil and boil them, as opposed to roasting them like the US does. Some websites suggested that this is why we have peanut allergies. Also according to wikipedia, the reason we have the peanut allergy is that we do not introduce children to peanuts until they are a toddler because the doctors tell us not to. The peanut allergy sounds like the most deadly allergy of all, and yet we consistently have peanuts in foods because it’s cheaper and it’s a protein. 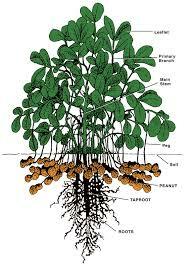 There are many types of peanuts, including Spanish, Runner, Valencia, and Virginia. However, I think these are the peanuts grown in the US while China and India grow the majority of the peanuts in the world, with the US coming in third in amount grown. So next time I think of plain peanuts as unappetizing I’ll think of China and other parts of the world that use the versatile peanut to a higher power. « Do you observe the local food movement? If not, may I suggest an alternative?